"Buns of the Patriots, Part 1" North Korea has a nuclear warhead aimed at Hawaii, and every last American commando unit sent in to disarm it has gone missing. With the clock ticking, the fate of the Aloha State rests in the paws of U.S.A.-G.I. 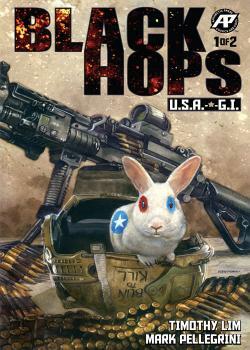 This dauntless, highly trained special missions leporid must now cross the 38th parallel and take on the Nork forces, both man and animal, to save the world from a nuclear war!